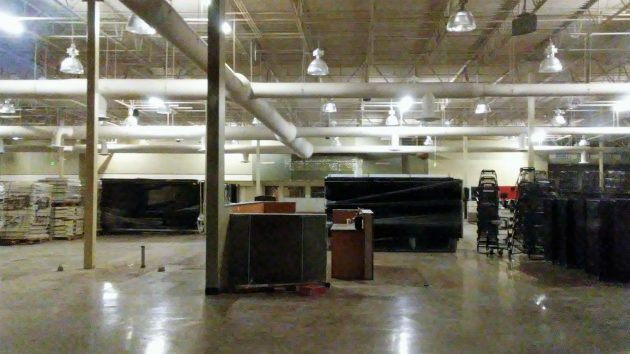 Equipment stored in the future grocery store looks like it’s awaiting some action. The latest holdup in plans for a new supermarket and hardware store in North Albany seems to involve the city building permit. It’s been applied for but not yet approved. The city valued the prospective renovations at $300,000 and collected a fee of $1,184.95. A note on the city’s online file says the applicant would also need to have a site plan reviewed and approved. No site plan has been filed. When I asked about this last week, I was told the site plan would be needed only when the store operator started an outdoor garden center, and its lack so far was not holding up the building permit. But since the garden center has been part of the plan, presumably the site plan review will have to take place if the city insists. As of Tuesday, Heenan had not heard back from the applicant. “I’ll be getting in contact with them later this week if I still haven’t heard anything,” he wrote. Of course it hasn’t been approved yet. Not enough city bureaucrats have had the opportunity to demonstrate their need to the community through the review process. City blessing will continue to pend until all demigods have been placated. Stupid bureaucrats and their “egress systems”. Why can’t people just die in fires like the good old days? If the Triangle Shirtwaist Factory fire taught us anything, it is that bureaucrats are always interested in human lives and well-being, and not focused on the stuff that really matters: helping to lower the overhead of corporate overlords! Sounds like the Decision-Makers at the illustrious Myers Group have been asleep at the wheel. As it stands now, City building codes and the permitting process are so simple, any moron can run the gauntlet. This ain’t rocket science. Secondly, there is nothing sacrosanct about a September opening. In the grand scheme of things another grocery store is just that. This could come in super handy spring ’18! I’m ready for a supermarket, so Myers and City get going please!